Leaders of the PDP in Osun State have appealed to the Ooni of Ife, Adeyeye Enitan Ogunwusi (Ojaja II) to come to the rescue one of them and former governor of the state, Senator Iyiola Omisore. The appeal was made by Osun Chairman of the PDP, Adesoji Adagunodo, who led about 20 other leaders of the party who visited the paramout ruler at his Ile Oodua Palace in Ile-Ife. 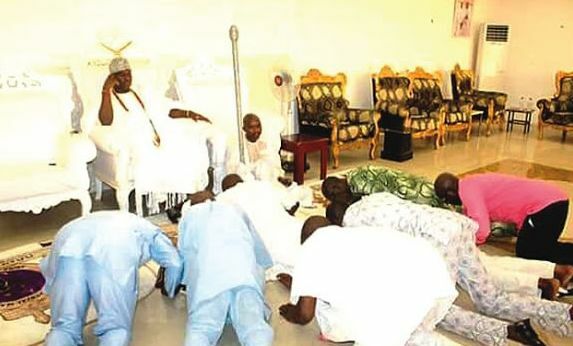 A statement by the Director of Media and Public Affairs, Ooni’s Palace, Mr. Moses Olafare, which was posted on the Facebook page of the palace on Saturday, said state chairman of the party, during the visit to the Ooni, apologised on behalf of the detained ex-governor who had not visited the king since he was crowned seven months ago. The PDP chief was quoted as saying as a true son of Ife and bonafide member of Oduduwa House, Omisore would be brought to the palace to do the right thing after his release. Adagunodo said, “Your Imperial Majesty, we are here to pay our homage to you as the father of our race who must be respected by all true sons and daughters of Yoruba race. “We also beg you in the name of Oduduwa to use your goodwill in assisting us to rescue one of our leaders, Otunba Iyiola Omisore, from the EFCC detention, even though we are not unaware of his attitude towards this sacred palace as he has refused to pay homage since you were divinely crowned seven months ago. In his response, the Ooni was quoted as saying he bore no grudges against Omisore. He said he would assist them, but they must first be sure that Omisore is clean of the corruption charge.